and initiatives to reduce stigmatization are of paramount importance. minutes (Bazelon Center for Mental Health Law, 2006). rural areas feel even more stigmatized (Gamm et al., 2002). the phenomenon of stigmatization needs consideration. signed as census. Data were collected over an 8-month-period. vant results about the district (Creswell & Plano Clark, 2007). 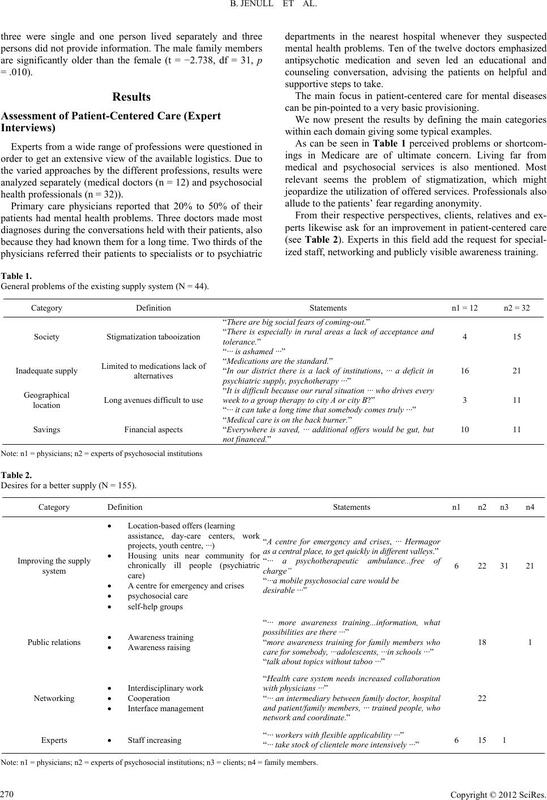 3) Main focuses and problems of supply. answered on a 5-point scale rated from “not true” to “true”. as to their family members. in the facility and then given to the project management. inductive techniques were used (Mayring, 2007). mean comparisons by t-test and univariate variance analysis). trict were on average 58 (±20) years (range: 6 - 93 years) old. persons did not provide information. health professionals (n = 32)). can be pin-pointed to a very basic provisioning. within each domain giving some typical examples. allude to the patients’ fear regarding anonymity. ized staff, networking and publicly visible awareness training. General problems of the existing supply system (N = 44). Desires for a better supply (N = 155). 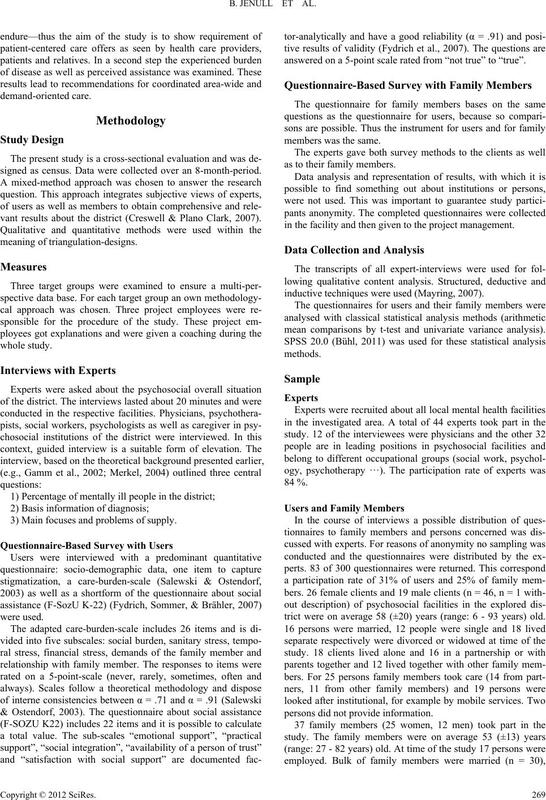 Note: n1 = physicians; n2 = experts of psychosocial institutions; n3 = clients; n4 = family members. who were cared for institutionally. women (t-test for independent samples, t = −2.413, p = .022). support: people under 45 years, 45 to 60, and people over 60.
significantly less support than younger family members. should be considered only valid for the studied area. health diseases, reports ranging between 20 and 50 percent. 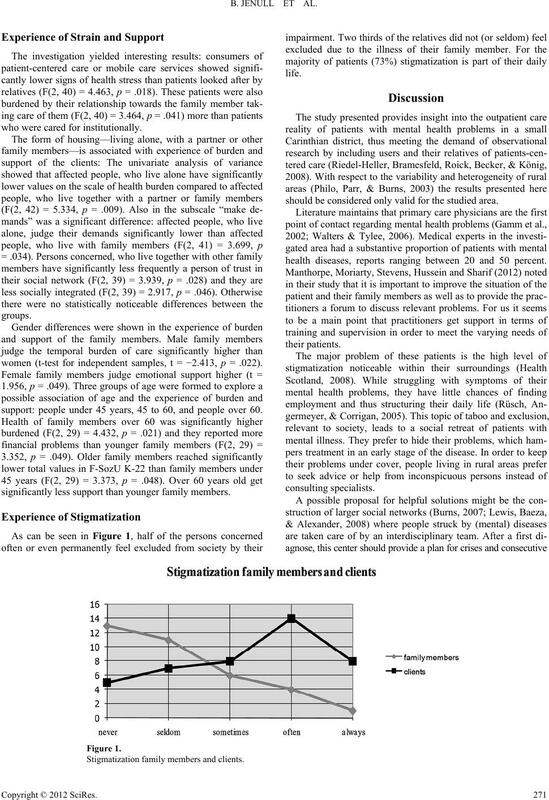 Stigmatization family members and clients. discrimatory comments and wrong accusations such as e.g. powerment and dialogue or discourse with all parties concerned. Relatives report an increase of strain by their own aging. in civic life and life-satisfaction decrease. provide affordable and comprehensive treatment and care. mental disorders. URL (last checked 14 August 2012). Blackstock, K. L., Innes, A., Cox, S., Smith, A., & Mason, A. (2006). (2005). Das Gesundheitswesen in Öste rrei ch. Horn: Berger. Bombosch, J., Hansen, H., & Blume, J. (2004). Trialog praktisch. mixed methods research. Thousand Oaks: Sage. Sozialen Unterstützung (F-SozU) (survey of social support). Manual. Kelly, B. (2006). The power gap: Freedom, power and mental illness. Social Science & Medicine, 63, 2118-2128. Knapp, M., McDaid, D., Mossialos, E., & Thornicroft, G. (2007). tion of mental health care. Maidenhead: Open University Press. care in Australia: Network structure, dynamics and sustainability. 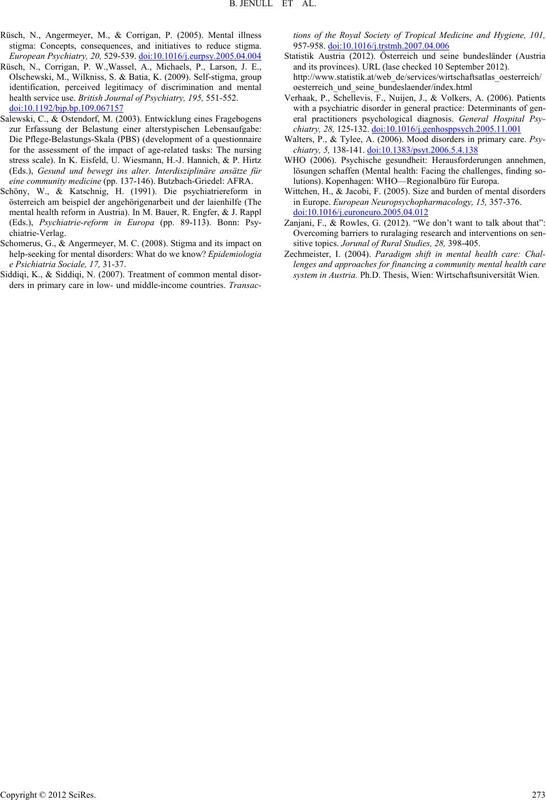 Social Science & Medicine, 67, 280-291. Manthorpe, J., Moriarty, J., Stevens, M., Hussein, S., & Sharif, N.
analysis). Weinheim: Deutscher Studien Verlag. more health services research). 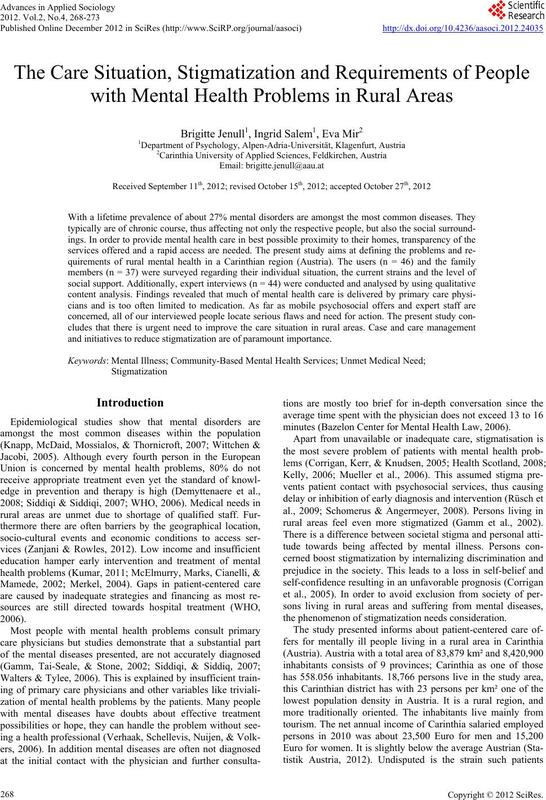 Psychiatrische Praxis, 35, 157-159.
stigma: Concepts, consequences, and initiatives to reduce stigma. health service use. 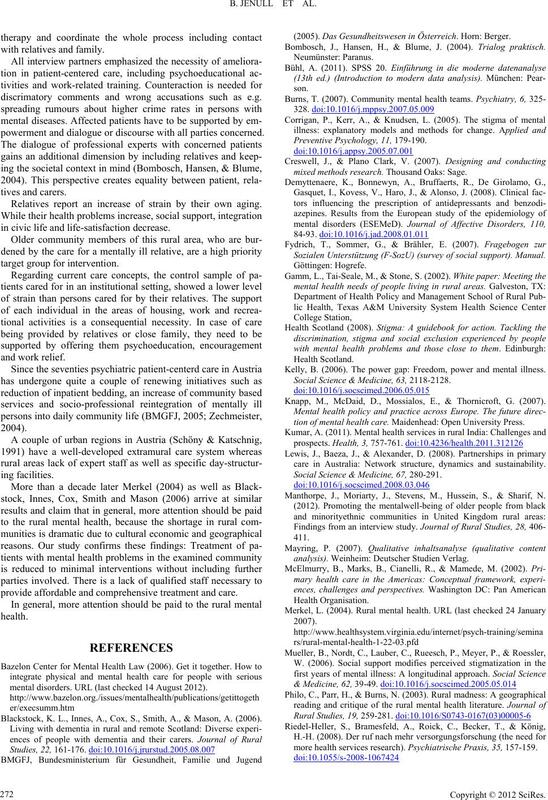 British Journal of Psychiatry, 195, 551-552.
eine community medicine (pp. 137-146). Butzbach-Griedel: AFRA. e Psichiatria Sociale, 17, 31-37.
and its provinces). URL (lase checked 10 September 2012). lutions). Kopenhagen: WHO—Regionalbüro für Europa. in Europe. European Ne ur op sy c hopharmacology, 15, 357-376.
sitive topics. Jorunal of Rural Studies, 28, 398-405.
system in Austria. Ph.D. Thesis, Wien: Wirtschaftsuniversität Wien.